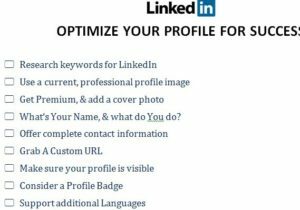 LinkedIn Optimize Template: Optimize Your LinkedIn Profile Today! LinkedIn has quickly become the most relevant websites when it comes to employers looking for employee information. If you’re new to the system, you might be a little overwhelmed with all the questions and invites you will get from the site. The free LinkedIn Optimize Template is designed to help you understand what’s important and what you need to add to your own profile in order to succeed. You will receive a simple checklist and go through the items given to optimize your profile. That’s it! After you go through the guide below with your free template, your LinkedIn profile will be perfect and ready to go. Get started today be downloading the template below. Downloading is as simple as clicking the link we have provided for you at the bottom of this page. The next step is to start at the very top of the page and begin to go through the items. For example, you will begin by researching keywords for your LinkedIn. If you’re looking for a job as a plumber, a great thing to do is search terms like “plumber” and the location you live in. The next step is to upload a professional looking picture of yourself to use as a profile picture. If you choose to get the premium version of the website, you can also add a cover photo to set your profile page apart from the rest. You should then go through and enter all the information listed for your contact information as well. After that, it’s all a matter of filling out, like a Profile Badge, connections, review skills, and endorsements. With everything in place, you will have all the tools necessary to build an impressive LinkedIn profile. Get started today by downloading the LinkedIn Optimize Template.